A: My background includes 20+ years as a professional Graphic Designer, Photographer, and Art Director, working both in-house and freelance. I also have professional marketing and writing skills. While in Los Angeles, I designed two magazines, one being ACT Like A Child Magazine. My first L.A. magazine was a fully interactive, digital magazine app, and ACT Like A Child Magazine will be one also, as soon as we get the funding for it! I am also an adult actor, primarily commercial work. I love working on set! Q: What inspired you to start Act Like A Child? A: After traveling across the country to help launch my daughter’s acting/performing career, I soon realized that Hollywood is no child’s play. I found out first hand that it takes a lot of industry know-how, preparation, networking, determination and hard work to even make a “dent’ in Hollywood. After thinking a lot about it and discussing it with a friend of mine, Sueanne Steinacker, (a talent agent), who herself, was also going through the same things with her daughters, we decided to help others. Families who have found themselves in Los Angeles, working to make their own kid’s dreams come true. We decided to seek out industry professionals who would be willing to share their wealth of information. Our editor, Jasmine Fontes is a producer for a LA production company. With the right tools, tips, and advice, our readers can develop a plan for their child’s career. Things are done the right way and not relying on luck, or thinking that because their child is good-looking or has been in a school play, that the agencies, casting or directors will want them, Agencies and casting get literally thousands of submissions from good-looking, talented hopefuls. Our readers will learn how to stand out and feel informed and confident with the choices they have to make! A: What we look for is quality, trustworthy inspiring people who have a great tale to tell regarding their own journey to help their child live their dreams. It is even better when that person is an industry professional who is working in the field and is able to share their wealth of information. We have professional actors, performers (singers and dancers), models, directors, acting coaches, casting directors, agents, and more, offering their personal experiences and advice in their articles. We love reader’s stories and comments and welcome them! We also love reader’s questions so we can help them with issues that they need real answers to, because chances are, there are hundreds in the same boat, needing those same answers. Q: What are some common mistakes stage parents make? A: Probably one of the biggest thing is “smothering” their kids. There is a fine line of being there to manage your child’s career (which is very important, keeping them safe and happy) and not going over-board with their training, micro-managing, pushing them to do things they aren’t ready for, or don’t want to do. This partnership has to be a fun, inspiring, uplifting, an adventure for both parent and child. It does require a lot of discipline and work, as long as the parents infuse positivity and encouragement with their children. Allow kids to be “kids”. They need downtime and playtime with friends. Life needs balance. Also, another mistake is trying to “coach” your own child. It just doesn’t work, unless you are a professional acting coach, and even then, the child will probably listen to another person better. Be there to encourage for your child and be a positive role model and please don’t try to live your life through them. Q: What do you look for in a cover star? A: Well, we have three levels of talent that we look for – with all three, we hope to help launch and promote their careers. For a young child to the “twenty-something” actor/performer that is new or fairly new to the industry, we offer the “Cover Star” section, complete with their headshot and short bio, they just need to submit through our website: www.act-likeachild.com and they will be prominently displayed in a special section of our magazine. The first six headshots submitted for each issue will be on the cover and the next six will be on the table of contents page! We also list them on our Facebook page and our website, in hopes that casting and directors will have a great place to see fresh talent. All kids/teens/twenty-somethings are welcome to submit! Based on the bios, we sometimes select kids to be interviewed for our “Special Feature”! …..We also offer interviews and inspiring stories from our “up and coming” kids/teens/twentysomethings for a “Special Feature” (2-page spread w/photos) for those who are working hard in their field, who have a bunch of booked work and have a great story/journey to tell….Lastly, for our “Cover Feature”: (Cover shot and a 2+ page spread w/photos) is reserved for the kids/teens/twentysomethings that are currently booked and working in their field, have IMDb credits and are currently in a project that our readers can follow, such as a recent or upcoming full-feature movie release (lead or supporting actor), principal in a national commercial, a singer/group with a new song or album release (on iTunes), a television show (reoccurring, guest or principal), principal on stage, in a professional show (acting, singing, dancer), model in a current fashion/ad campaign or runway show, etc. Parents, publicists, managers, etc. are asked to submit photos along with their credits for our consideration for a Special Feature and the Cover Feature! It is that simple! Q: What makes a child performer a natural? A: You can just tell when a child is in their element and experiencing pure joy when they are on stage or in front of a camera. They create performances at home, using the kitchen chairs and blankets as props and Mom and Dad’s closet for costumes. They are constantly singing and dancing around the house and as soon as a good song comes on, they are there to perform it for you! They have that sparkle and come to life when they watch musicals and can perform the scenes with accuracy. They are well spoken, good listeners and great readers. A: I’ve been wracking my brain and I just can’t come up with anything! We have such amazingly talented writers and photographers who contribute their work to us and we feel truly blessed. We would love to go to the next level and get this magazine off the ground. We are currently on issue 12 and we really want to see it as a digital, interactive magazine app that would be a super fun, interesting and a ‘go-to’ resource for all kids/teens/twentysomethings (adults love it also) and their acting teachers and coaches! That talent managers and agents would have a quality resource to offer to their clients. 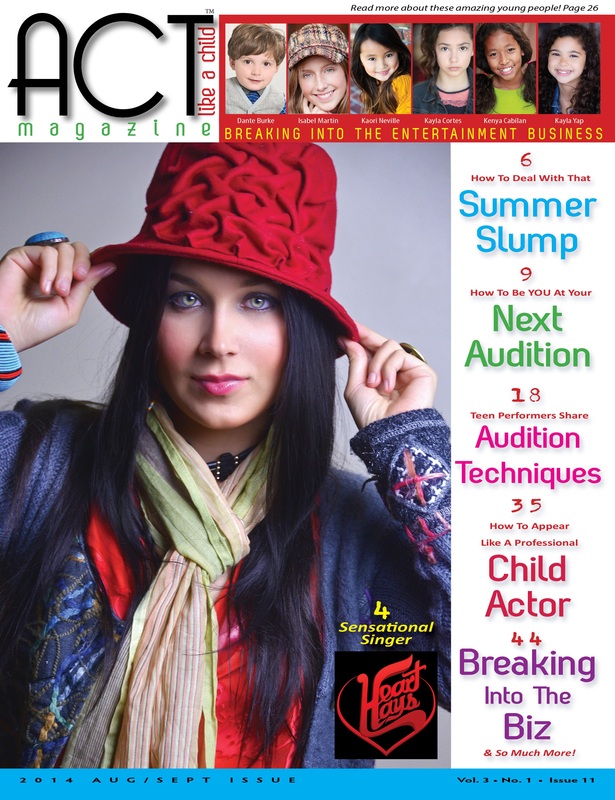 Even directors and casting could feel confident in referring their talent to the magazine for advice and information. Q: What are some of the challenges involved in starting a magazine? A: Honesty, it is advertising, funding and getting the word out to prospective readers. I know why they say that starting a magazine from scratch is probably one of the hardest things to do – what were we thinking? haha! This project is totally a “work of passion” getting each issue out, as a grassroots effort, to boot. It is a dream of mine that some amazing person or organization, of influence, will see this magazine and love it! They, of course, would have the need to want to give back and help other young actor/performers get inspired and prepared for their career. Because they are as excited about this project, as we are, they would decide to help us financially to get to the next step with the interactive magazine app! If this is you, reading this now – please contact us! We would love to talk with you! Q: What kind of training do you recommend for children? A: For starters, get them into Improv classes. Through improv games, kids learn to act and re-act naturally, helping them to think quickly on their feet. This will help with auditions and interviews. I really feel that kids need to act like kids as long as they can. They are natural actors. As they get older, such as middle school age, then start acting classes. I feel any training in the arts is an asset. Professional dance training and singing classes teach children how to move and use their voice, which is awesome preparation and fun to participate in. Read, read, read as much as they can! Let them read, out loud, as much as possible, so they can hear their own voice and feel comfortable with conversation. Have them audition as much as possible – the more they are in front of the camera or on stage, the more natural and comfortable they are with the process. They will need to ‘ooze’ confidence with this process. Q: When is it time to tell a child to give up and how do you go about doing it? A: I would have a hard time telling a child to “give up”. Parents should feel so lucky if their child has a passion that gets them out of bed each day – especially teens. So many kids flounder because they haven’t found that “something special” that motivates them. Statistics show that most child performers won’t end up pursuing acting as adults, but there are still countless benefits they can gain as they make the journey. If the child is truly the originator, bitten by the ‘performing bug’, it is in their DNA and there really isn’t anything a parent can do to stop that. They act/perform because they have to. Nothing else will truly satisfy them and fill them up the way getting on stage or in front of a camera does. Offer them other choices, if you are worried. If they have choices, then they will learn what they really want to do. Until then, support them! Don’t stand in your child’s way of self-empowerment, happiness, self confidence, and success, to become the best ______________ (let your child/teen fill in this blank) they can be! Did you know that many successful people in casting, management, teaching, producing, directing and more, had their start as actors/performers? Well they did! Along the same lines, many successful professionals studied theater/dance in the hopes of the big acting/dancing/performing career. A performer learns valuable skills that will help them their entire lives such as, building self esteem and confidence, improved reading skills, learning how to speak in public, independence and responsibility, social interaction, listening skills, risk-taking, learning to think on your feet, poise, how to deal with rejection, and so much more! Being realistic with goals is always very important, but if there is a true dream, backed with determination, a real plan (developed by reading ACT Like A Child Magazine) and support from family, then stand back and hold on for the adventure of your life!